First, I would like to thank Scott Ford, Kathi Mayer and Robin Crossan for their principled and courageous stand against the raging mob in their decision to support the rule of law. You have truly demonstrated profiles in courage in choosing not to reopen the approval process for the Pine Grove Road project. In doing so you stand in the light of the angels. Secondly, for those citizens who booed and used profanity against the members of City Council, shame on you. You curse the darkness. Finally, for those who would like to channel their passion onto a more productive path, I have a proposal. Instead of using the power of government in a tyrannical fashion to get what you want, let us come together as a community and use the power of the marketplace to craft a win-win solution. Let’s buy the property from Marriott. We do this by communicating to Marriott how deeply unpopular this project is in the community. Make an appeal to their better angels as seen in their own environmental policies and values. Show them what bad press they can expect to receive if they go ahead as planned and offer them an alternative. That alternative will include purchasing the property from them, finding a different location to build a hotel and generating as much favorable press coverage about their environmental values and concern for the community. Several years ago Noreen Moore and the good folks of Yampa banded together as The Friends of Crossan’s Market to save that iconic building. They raised over $1 million and created a valuable community asset for the city of Yampa while preserving an historic site. 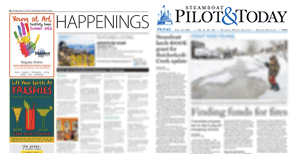 Here in Steamboat we have a wide array of nonprofits who have a stake in this, plus a group of impassioned citizens who want to see this happen. The Yampa Valley Land Trust could purchase the development rights. Tread of the Pioneers, Historic Routt County, Yampatika, the Yampa River Botanic Park and the Yampa Valley Sustainability Council all have an interest in the preservation of this piece of property. They could be involved in the fundraising. To show that we are willing to put our money where our mouths are, my wife, Kathy Cline, and I are willing to put up $10,000 in a matching grant to a certified 501c3 that is willing to take on this project with us. We may not be able to save the world, but if we band together, we may be able to save this small piece of Steamboat.